Thanks very much, TIFreak8x. I hope to preliminarily complete all fabric & thread components, then hook up a wired interface for initial testing while I design the complete electronics. *bump* Bodily ripped out the elastic in the wrist of the glove; it was cramping my conductive thread and making it short against adjacent threads. Sixteen of nineteen contacts are wired to the breakout socket, with the seventeenth partially done, and two more to completely finish. Continuity and adjacent short testing will then continue wired to a breadboard. *bump* Breadboarded circuit tested, seems working, still haven't finished sewing the last 4 contacts to the breakout. 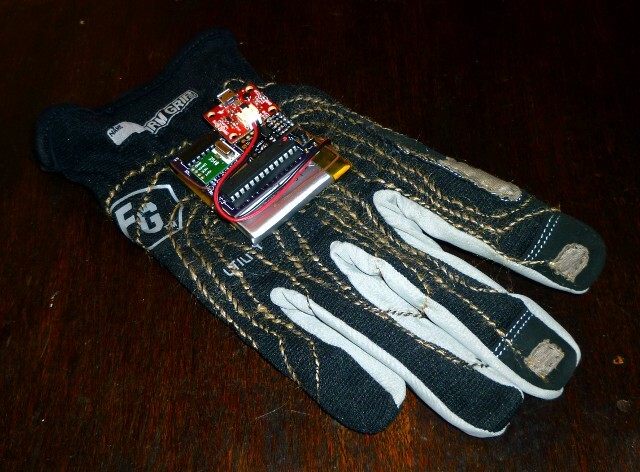 Random demo of the glove connected to the prototype circuit on one row and one column. Notice the two 74LS138 TTL ICs forming a 1-to-16 demultiplexer in the middle of the breadboard. *bump* I'm afraid I've been dragging my feet on this. 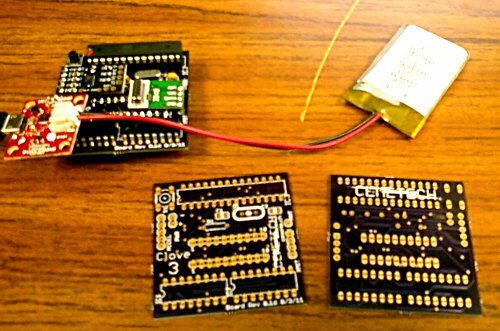 Next thing I need to do is get that glove controller design onto a PCB and assembled. My current bill of parts for testing; I still need to get the PCB layout as well as the arrangement of pieces into the glove-back enclosure figured out. No, it means that the PCB fab house I'm probably going to go with offers 3 PCBs for cheaper than another house offers 1 PCB. 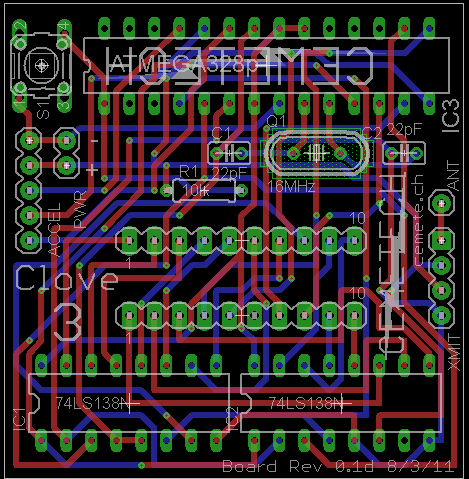 I'll probably have to go through an iteration or two, especially since I'd like to be able to consolidate the functionality of the accelerometer breakout board and power supply breakout board into the main PCB eventually. 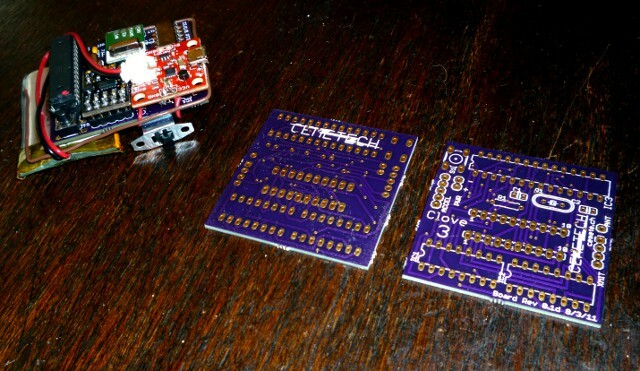 *Bumpity bump* PCB is designed! I'm going to send it off to the fab house today. Tari, I'm afraid that structurally I had to rearrange the results of your most excellent and extremely appreciated help, but your rearrangements helped me to understand much more how to get sane routing and not entirely relying on the autorouter. I just need to check that I have the middle 20-pin header matching the pinout on the back of the glove, and I'll send this out to DorkbotPDX. Pretty PCB. You could turn that pattern into some kind of logo. Oooh, traces framing letters, that's an awesome idea. I'll have to try that on a future one. *bump* PCBs are here at last; I populated one of them with accelerometer, two 74LS138s, uC socket and an Atmega 328p, transmitter, crystal, capacitors, resistors, power header, and reset button. Check out the populated board and the two sides of the unpopulated boards; I'll try to get a better photo soon. wooh. How long do you estimate before you'll have everything put together? The populated board is more or less done, although untested; I just need to tuck the battery and power switch under the board and the power supply board on top, then get out my Arduino suite and throw some firmware together. 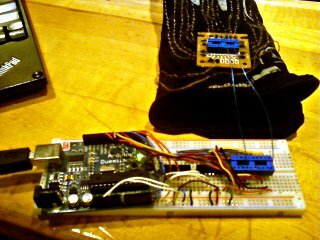 True testing will require wiring up an Arduino board with the RF receiver and try dumping out the output of the glove back board over serial, assuming it functions properly. I'm happy to hear that after stumbling through some wireless transceiver problems yesterday evening, I managed to get he clove to start dumping keypress and accelerometer information wirelessly last night! There's still tons to do, especially on the receiver side, and some tweaking of the hardware on the conductive thread/fabric end, but it's a step in the right direction. Please enjoy these better photos. Maybe you should make a logo for this that involves garlic-themed imagery. Also, how much code do you have to write for the receiver to be able to send HID data? It will require quite a big of work, especially since I'll need to make a USB HID Hybrid device rather than a HID Keyboard or HID Mouse. Luckily I have some experience with VUSB from the USBHID/"$10 Bridge" for gCn, but it still will be a challenge. Are you keeping the same style of typing from previous Clove iterations? As a matter of fact, I am not; that's an excellent question. I got lots of criticism about the huge key set, and although it was a good idea for maximal flexibility, it was a bad idea for typing speed. Clove 3 centers around the observation that people can type really fast on T9 phones with practice, allowing the same sort of typing. The downside is that the receiver needs an SD card with a dictionary, plus the ability to do fast word lookup, which will be quite a challenge for me and a microcontroller with 2KB of RAM. The downside is that the receiver needs an SD card with a dictionary, plus the ability to do fast word lookup, which will be quite a challenge for me and a microcontroller with 2KB of RAM. "radix tree, radix tree, radix tree, gently down the stream, merrily merrily merrily, life is but a radix tree"
You could experiment with ordering child-nodes with an LRU-based priority instead of alphabetically, but I can't think of any data structure other than a Patricia Trie that really makes sense in that context. Indeed, I'm planning the thick branches cached in RAM, terminating in file offsets of some sort to fetch prefix-sorted bins. Since there's nine alpha keys in the T9 system (or 8, depending which I use), that's either 81 or 64 bins if I use a two-key prefix bin set, or 729/512 for three-key. Three-key sounds like it would overwhelm the RAM though, even with 3-byte-per-prefix storage, especially considering I'll need plenty of RAM for VUSB and other data structures. There are 270 users online: 8 members and 262 guests. Members: commandblockguy, kg583, Michael2_3B, RogerWilco, TheMustardCat. © Copyright 2000-2019 Cemetech & Christopher Mitchell :: Page Execution Time: 0.678020 seconds.